Let's say you are like me and you write at a few different sites where your Google authorship is linked to all those sites. For example, I write here at the Search Engine Roundtable and also at Search Engine Land - both pretty well known search marketing resources. What if I did something evil at one site, like sold links but kept the other site clear of issues? 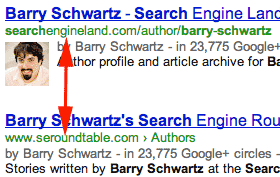 Would my association via my Google profile, my Google authorship, on both sites, play a roll on the rankings of both sites? Would the site that is not 100% squeaky clean have an impact on the site that is 100% clean? Google's John Mueller said the association has no impact. Meaning, what one does on one site, should generally have no impact on the other site. Of course, there are always things one can do offsite to impact another site, so that is why John used the word "generally." No, there generally wouldn't be a connection with regards to crawling, indexing, or ranking between two websites that are both linked from your Google Profile. Will that change? Who knows but right now, we have Google on record about this.